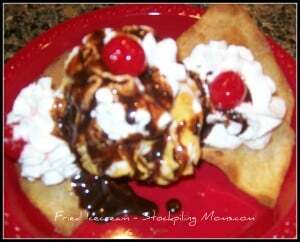 Mexican Fried Ice Cream is an easy no bake recipe that is perfect to celebrate Cinco de Mayo! Scoop 8 large icecream balls and place on a cookie sheet and put in your freezer for about 1 hour. Fry each tortilla, one at a time in hot oil over medium/high heat until crispy. Tortillas will float to the top. Combine the cinnamon and sugar in a small bowl. Sprinkle half of the cinnamon mixture over both sides of the fried tortillas, coating evenly. I like to use a shaker or a McCormick cinnamon/sugar grinder. Using the other half of the cinnamon mixture, combine with the corn flakes or cinnamon toast crunch cereal into a small bowl. Place a scoop of ice cream in the cereal mixture and with your hands roll the ice cream until it is entirely coated with cereal mixture. Place the ice cream scoop on the center of 2 cinnamon/sugar coated tortillas. Spray whipped cream around the base of the ice cream. Spray an additional whip cream on top of the ice cream. Place a cherry or two on top of the ice cream.